Michigan voters can see how many taxpayer dollars their lawmakers voted to give away in the form of subsidies to particular businesses and developers, thanks to new research from the Mackinac Center for Public Policy and MichiganVotes.org. Researchers analyzed 71 public acts that authorized spending $16 billion on business subsidies from 2001 through 2017 to build the scorecard. Of these, 37 bills were able to be scored and the voting record of 498 lawmakers on these bills make up the scorecard. It shows how much of taxpayers’ money each lawmaker approved handing over to select businesses. As the scorecard demonstrates, giving taxpayer dollars to select businesses is bipartisan. Of the 498 lawmakers scored over 17 years, the average Democrat approved $1.62 billion in business subsidies, while the average Republican approved $1.47 billion. 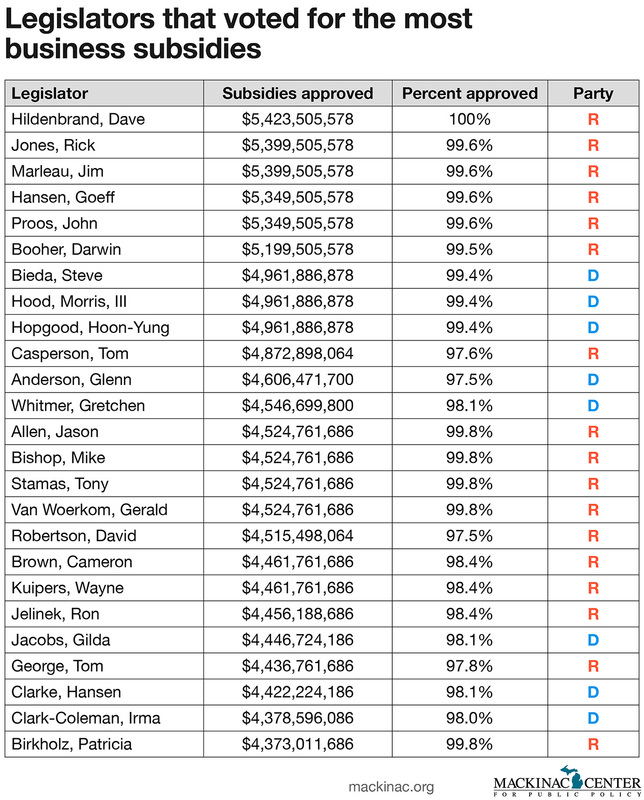 Only 22 lawmakers approved zero business subsidies. “Both parties are complicit when it comes giving taxpayer dollars to politically well-connected firms and developers,” said Jack McHugh, senior legislative analyst at the Mackinac Center and editor of MichiganVotes.org. The scorecard only includes laws that authorize actual payments to businesses, not other forms of special treatment some favored firms receive, such as property tax abatements. It also left out laws that authorize new business subsidies when they were part of a large package of bills, such as the approval of omnibus budget bills. Research from the Mackinac Center and others indicates that these business subsidy programs have not grown the state economy or increased employment on a net basis. A recently released Mackinac Center study on a newer subsidy program called the Michigan Business Development Program showed that the program was not effective and even cost jobs. “Michigan’s business subsidies have hurt the economy and done so with little transparency. This scorecard shows that lawmakers have consistently put the welfare of select business owners ahead of taxpayers,” said James Hohman, director of fiscal policy at the Mackinac Center. The PDF of a report explaining the methodology used to build the scorecard can be found here. An article providing additional details and results can be found here. The full scorecard, showing each individual lawmaker’s voting record on corporate handouts, can be found here. The Mackinac Center for Public Policy is a nonpartisan, free-market think tank dedicated to improving the quality of life for all Michigan residents. Its policy experts develop solutions to state and local economic policy challenges based on fundamental principles of free markets, individual liberty, limited government and the rule of law. Headquartered in Midland, Mich., the Mackinac Center has grown into one of the nation’s largest state-based think tanks since its founding in 1987. For more information, visit www.mackinac.org.